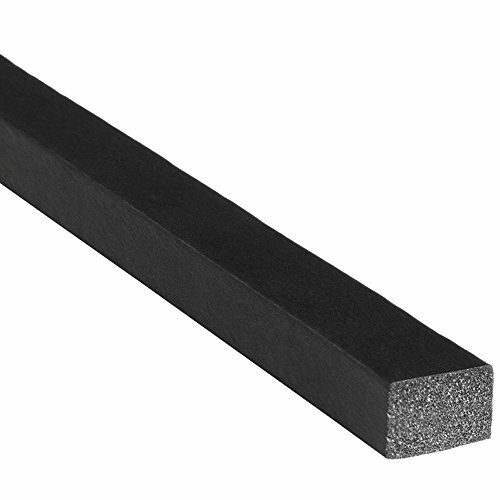 Rubber Seals create an easy-to-close seal against dust, noise, and vibration. To prepare, cut to length with scissors or knife. Prior to installation, ensure bonding surface is properly cleaned with a 50/50 mix of denatured alcohol and water solution. The Solid Rectangle Rubber Seals are available with two adhesive application options: high-strength foam acrylic adhesive (BT) and general-purpose pressure sensitive adhesive (HT). The (BT) adhesive creates an airtight seal between the rubber and substrate and has low initial tack for easy repositioning. The (BT) high strength tape system creates the ultimate bond between the rubber and substrate, has the highest peel and shear resistance, and can be used under high loads of stress and force. Also, it has low initial tack for easy repositioning during installation and requires 72 hours of cure time for full bond strength. The general-purpose pressure sensitive adhesive (HT) is ideal for light-duty applications and is best used to hold the rubber seal in place while installed in a static application or compressed between two stationary objects. (HT) may be used in some light duty dynamic applications against a variety of substrates. WEATHER-RESISTANT solid rectangle rubber seal provides excellent resistance to water absorption, ozone, sunlight aging, low temperature and compression set. VARIETY OF DIMENSIONS AND SIZES available to fit your application need - allowing for the right size and thickness of rubber seal strip to be applied to the job. View More In Trims, Seals & Gaskets.